After yesterday’s feed. the starters both began to expand (up to the purple line) Wally had a pretty good rise this time, too; he seems to be catching up quite well. We may be just one or two feeds away from finishing the project. PJ is clearly well under way. Both starters were pretty much done expanding within three or four hours before they started to collapse. This means they went for the remaining 20 or so hours “unfed”. They had, in effect, chomped through whatever food they were going to in rather short order. You can even see in the photo a very slight layer of liquid on top of the starter. This is “hootch” and it’s a normal byproduct of our friend the Lactobacillus sanfranciscensis when a starter is ‘hungry’. The solution? Feed it. Since the amount of fresh food the starter has been getting is at a ratio of 2:1:1, we know that this is a rather slim buffet. Once again, let’s look at the weight to see what that means. 1/4 cup of 100% hydration starter is usually going to be approximately 60 grams. We were adding 28g of water and 28g of flour. For ease of calculation, let’s call those 30g. So in effect, for each 2 grams of “old” starter, we were adding 1 gram water and 1 gram flour. Ergo, our ratio here is 2:1:1. I decided to make a decision of the executive variety: This feed, we’re changing the ratio to 1:1:1, so for each gram of old starter, I’ll add 1 g of water and 1g of flour (or, to match the previous ratio, 2:2:2). This in effect doubles the amount of food the beasties will have to consume and populate. So here’s our new starter ratio. These two are done with a formula of 30g starter, 30g water and 30g flour, 1:1:1. We now have 90g total starter where previously we had 120g (60+30+30g); this is why the amount in the jar is reduced. I’ll try to get photos of the expansion in the next few hours. I expect Wally may give us a good rise this time around. PJ has gone well past doubled, even Wally is nearly doubled. Way to go, boys! I’ll continue to keep an eye on them today. Wally, although showing decent activity still needs a few feed to “rinse out” any remaining stink from his early battle with nasty critters. He is smelling much better but it’s not quite there yet. The increased feed ratio will help a lot in that department. Here we are, six hours after the feed and Wally’s gone and more than doubled, he’s just peaked and showing signs of receding now. Meanwhile, PJ’s nearly tripled but is out of fresh food. Looks like I’ll need to feed them again – and I do. These are hungry boys! This is actually quite good; while PJ seems to simply be repeating, it gives Wally a chance to catch up and clear out his stink (still there, but much lighter). Here we are 3 hours after the second feed and we have doubled both starters. I think we can officially call Wally “under way” although we now have to take time working the last of the stink out of him. 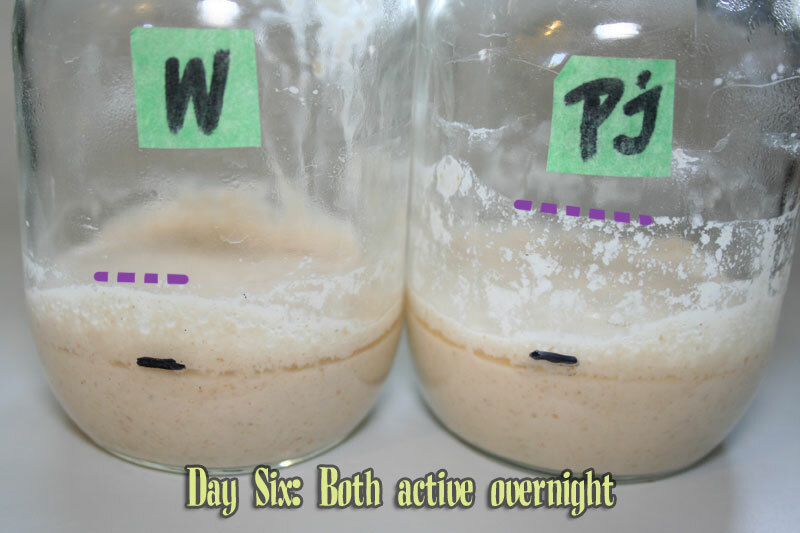 That alone is a good reason to head directly for the pineapple juice method, even if we have a “viable” starter at the 6 day mark with just water, it will take us several more feeds before he’s clear of that odour, while we totally skipped over that ordeal with PJ. 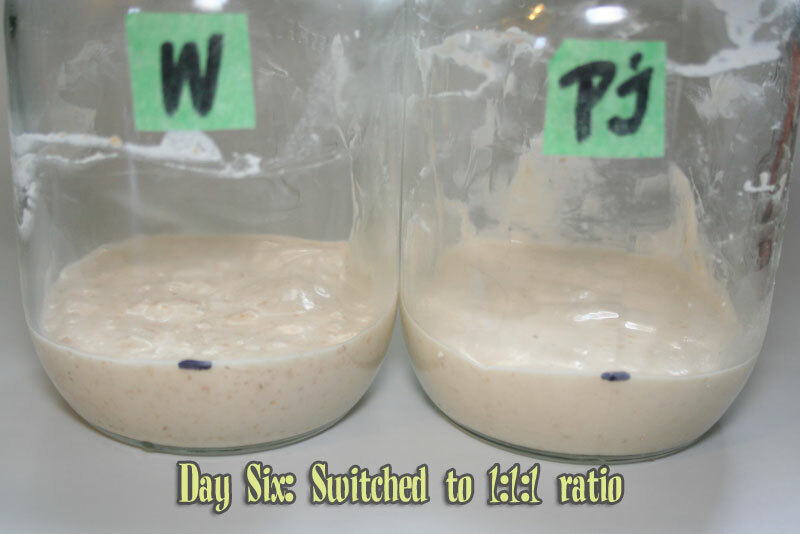 And PJ’s been going well for a couple of days already, so it sped up the yeast activation stage as well. I’ll put a mark on where they’re at now and check again in a couple of hours, see if they increase a bit more or if they’ve peaked already. If they look like they’re receding, I’ll give them another feed since they’re at the most active and looking for more food, then leave them for the night. Tomorrow is day seven and it’s certainly looking like they’ll be set for the next stage, maturing. 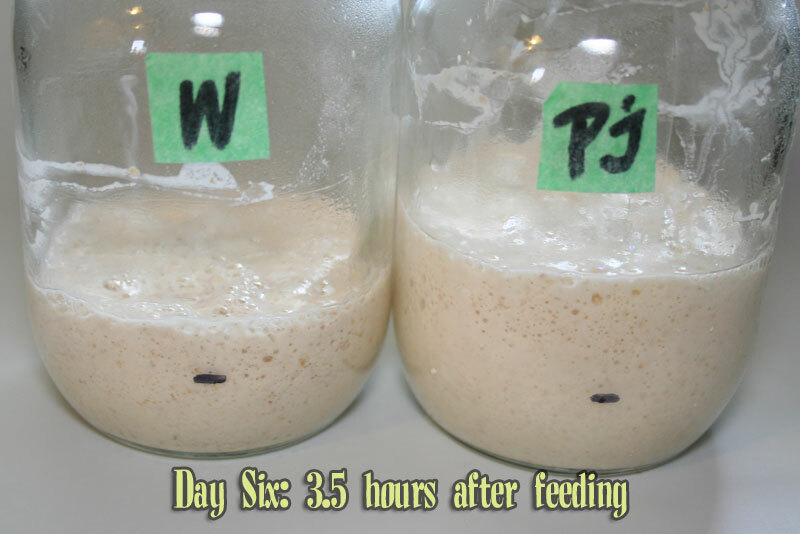 Question on these extra feedings that you are giving, do you dump out a portion of the starter and then add more flour and water to keep the percentages the same? I’m on Day 4 of following the pineapple method as listed here and on Day 5 of my second try on Dan Leader sourdough method. The pineapple method on Day 4 seems to be way ahead of the Dan Leader batch. It looks like I will end up taking the pineapple batch and then slowly change the hydration to match the Leader sourdough so I can easily work on his breads. Thanks for providing this detailed post. Yes, since we switched off the pineapple juice on day 3, we’ve been removing some starter before feeding. If you didn’t trim it back you’d be feeding gallons of starter with bags of flour in no time. Seriously, we’re talking in a couple of days, you’d need to find a swimming pool for your starter if you didn’t toss some out. So cut your amount back and start each feed with a reasonable quantity of “old” starter. And just as an aside, you do NOT need to keep a lot. If you keep just 15g of old starter and add 15g of water and 15g of flour, you’ll hold on to 45g of starter. That’s just under a quarter of a cup. And it’s plenty. Keeping a larger starter has no advantages, EXCEPT if you expect to bake a lot, like two or three times a week, and would use that amount of excess regularly. When you starter has been going well for a while (I’d say give it two weeks at least) and it’s feeding time again, you’ll have 30g of “excess” starter that you can use in your bread recipe or collect for a couple days to put into pancakes or other “discard use” recipes. If your sourdough bread recipe needs a lot more than 30g, then just feed that up until it reaches whatever you need. At this time in the growing cycle, however, there’s no sense keeping that “starter” because it really isn’t starter yet. So toss it. And if you’re keeping the starter on the 15g:15g:15g schedule, you’ll be tossing just 15g – or about a tablespoon – of flour, not a quantity worth worrying about. As for changing the hydration, you can do that at any time, just feed 1:2:5 [S:W:F] (for example) and presto, you have a stiff starter. Well, anytime once your starter is good and active, I’d suggest keeping it going at 1:1:1 or 1:2:2 for a while since this lets you monitor the starter’s activity a lot better. At 1:2:2, I’d say 10g:20g:20g for a 50g total is still plenty. Thanks for the info. I followed your advice and the starter has turned out perfectly. I also realized that to make the Dan Leader starter work I had to also start reducing it on a daily basis in order to make sure it had enough food to grow. As soon as I reduced the amount of starter and started to feed it properly it also took off. I made Dan Leaders French Country Boule, Quintessential French Sourdough and Auvergne Crown since last Saturday. All have turned out great. I ended up turning one of the sourdoughs into a firm starter. Very easy process. I had the starter in the fridge since Sunday and pulled them out yesterday to feed, just to see what would happen. Both starters took off and were ready to go when I checked in on them after 8 hours. Decided to make Leaders Light rye last night to use up the extra firm starter I had. I put the high hydration one back in the fridge and will refresh tomorrow night or Sat for this weekends bake. The Light Rye loaf rose just as the book said it would and it even grew while retarding in the fridge overnight. I’ll bake it off tonight when I get home from work. It looks like my starters are alive and well and ready for baking. Thanks for providing the info, I would have still been struggling along if I hadn’t stumbled upon your site. By the way, you have some great bread shots on your blog. I originally put an 8 oz glass with hot water (from the hot water heater – need to measure the temp to see exactly how hot the water gets) in the microwave with Mina and got a small rise. 8 oz of hot water does not last very long so I moved up to a 4 cup measuring cup. I have an 8 cup measuring cup but was afraid of creating too much heat. Mina has almost doubled in 7 hours. She is a happy girl! I just need to keep her warm. Paul: Thank you for the words of wisdom on temps. I was a little slow to take your advise but Mina appreciates the fact that I did find a way to warm her up. I knew I’d find my answer here. I’ve been trying to grow my own starter (I have one but wanted to see if I can do it from scratch, using the Tartine Bread method, and with the knowledge that I should be a bit more patient if not using pineapple juice). Ever since day 3 I’ve had liquid on top but no rise. I didn’t realize I should just be feeding more often (it’s been once a day for about a week)! My old starter gets the “hooch” but I wasn’t sure a new starter should that has been fed daily. I’m at work now so my friends will have to wait until I get home, but hopefully they’ll be happier from now on! I am not clear on how often to feed it each day at this point? If you aren’t doing twice a day feeds yet, this would be a good time to start that if your starter is showing good signs of activity. “Morning” and “early evening” are close enough time periods. I did it at breakfast and at dinner, whenever those actually happened to be that day. If it goes too long on just one feed and runs out of food, you’ll start seeing “hootch”. This is a good sign it needs more feeds. Hi! I just wanted to say thank you for such a detailed look at how this method is done. I’m on day 6 of my OJ starter, and this morning I switched to the 1:1:1 ratio. Here I am almost 12 hours later and I’ve got a nice rise but it hasn’t doubled like yours did. Should I feed it at the 12 hour mark or just wait for it to peak again? Should I switch back to 1:2:2 at the next feeding? This is my 2nd starter in the past two weeks and I really want it to work, so the fact that it’s not acting predictable like it was just puts this nube on edge. Thanks! The golden rule of bread making: watch the dough, not the clock. SO yes, you should wait until the starter is nearly peaked. Why? Because we don’t exactly know what conditions the yeasties are in right now and it could simply be that the room is a degree or two cooler than they’d like to really get pumping. “Back to 1:2:2”? Were you seeing better results originally when you were doing a 1:2:2 feed? Was there a specific reason to switch away from that (getting poor expansion, for example)? Without a bit more detail, it’s difficult to diagnose or give pertinent advice. Lastly, get off the edge, that doesn’t actually help anything and just makes you stressed and the process un-fun. If your starter is expanding, even if not “humongously”, but on a consistant basis, then it’s just a matter of a bit more time AND PATIENCE. This last being the super secret ingredient to making good bread. Good bread is “Slow Food” and patience is necessary. Stressing is not. So relax, enjoy the process and let your new pal do what he/she needs to do and you’ll get excellent bread from it/him/her in no time. Well, a couple of weeks down the line, anyway. Got more questions? Ask away! Ah, that makes more sense. And no, it would be best to stay on the now bigger feeding and even head to 1:2:2 in a few more days. If you can. try to find a warmer, cozy spot for him so that he gets a little help to attain full expansion. You can also use lukewarm water when feeding to help things along a bit. That should get you a nice bit of activity. Sounds like everything is doing well, so just keep on doing what you’re doing and you’ll have a great little starter soon enough. Keep feeding two or three times a day for at least two more weeks (better still, three) before he starts living in the fridge. This will give him a good shot at strengthening up and developing a little personal character. And congratulations on being a new Starter Mom! Hey! Just wanted to let you know that I baked my first THREE loaves of sourdough just a couple nights ago. It was a wild ride but worth it all along, with a lot of thanks to you :). So happy to be a starter mom, yay!! I’ve been reading and following this portion of your blog since last Wednesday. Figured it was fair at this point to email for help. I’m on day 7 of creating a SD starter. Started with the pineapple method last Wed, and on day 4 stopped the pineapple and went to the 2oz starter: 1oz flower: 1oz water. It starts of like a thick paste and by the next day it’s a liquid that pours easily. For days #1-6 it sat on my counter (Temp was in the 90s on days 1-4, and days 5-7 it was in the 70s). I DO have small bubbles (but not a lot), and it smells like a yeasty beer. I even tasted a very small drop that landed on my finger (man it was sour!). Day 7 I put it in my oven (not on but just looking for a warmer place), and about 20 hours later still nothing rising, and I’ve still got the same old pourable liquid to deal with tonight. Do you recommend any next steps? If your kitchen hovers in the mid 70’s (temp, not style wise) then this is a fine temp to keep your starter at while cultivating, no need to find a very warm spot. When you say “2 oz” are you talking volume or weight? How often are you feeding and how much are you discarding? – It could be that your critter population is rather low and, anytime you feed and get rid of X amount, you’re actually diminishing the number of yeast and lactos to a really small quantity and they just don’t have the population required to show good activity. The solution, in that case, would be to feed but without discarding. Yes, you’ll soon have a fair bit of starter but won’t have cut back the critters so they’ll get a better leg up and eventually start showing good signs of activity. Once there, start cutting back again as per normal. Remember that each colony (mine vs yours vs the next person’s) is going to be different so you should not go by “On day X, this is where it should be”. My starter may be ahead or behind where yours is, so go by it’s status, not its number of days. You may need to stick to “Day four” for a few days until your starter moves on to the next stage. Thanks for your quick reply (even with all my typos)! The feeding each day has been done by weight (in grams using my digital scale), and not via volume. Each night before I go to bed I pour out enough of the starter from the night before to leave me 57g of starter (2oz in weight). To this 57g of starter I add 28g of KA Bread Flour and 28g of filtered Britta water. The flour and water is also added via weight and not measuring cups or spoons. So in summary it’s been a nightly regimen of 57g/28g/28g (S/F/W) before I go to sleep each night. Tonight I’ll try what you recommend above, that is to feed using flour and water and NOT discard any of the starter from the night before. How many days should I give it before I update you? What things should I be seeing? Just an expansion of the starter? A mellow smell? Glad to hear you are using weight which gets you the right consistency to be able to catch the bubbles. Now what you can do is feed once a day – if it’s not active, it really needs little or no feeding – or even go a few days not feeding at all. One thing I’d make sure of is that you use a rubber spatula to clean the sides (or at least ONE side) of your jar very well so that if it’s expanding and falling back without you catching it, you’ll be sure to see the “high tide mark” it will leave. Give it two or three days and see if letting it build up its population does the trick. It’s been 6 days so I thought I’d give you an update. Woo hoo! So cutting down on the water helped significantly. The mixture now has a bit of a doughy consistency to it! The mixture also finally bloomed , as you can see by the photo taken from the side view, with the rubber band around the container. It smells yeasty and today (wed) has been 2 weeks I’ve been cultivating this. – Should I now start a new feeding regimen for a few days consisting of disposing all except for 26g (or 2oz) of the starter and feed with an additional 28g or BOTH water and flour? – When I start to prepare it for baking with it? – How do I know it’s “ready” to baking with? – Do I still store it on the counter or keep in the fridge now? – If I need say 1.5 cups of starter to bake my first bread, how do I get my starter up to that amount needed ? Congrats on the new pet! 1) Yes, do the 1:2:2 feed, twice a day. Keep going for 2 more weeks, morning and evening or when you have breakfast and dinner. Exact hours isn’t necessary; the starter can’t read a clock. 2) – Not sure what that question was; toss it back at me. 3) You’ll know when your starter is ready to use when it reliably and consistently doubles or triples after X hours, anywhere between 4 to 8. Mine, after feeding a couple of times from the fridge, gets up to peak in about 5 hours, give or take. So when I do use it in baking, I aim to use it at about 4 to 4.5 hours, a little before it peaks and then starts to collapse. You want the starter still good and lively. 4) Don’t toss it in the fridge quite yet. The time it went through while you were getting it to this point can be considered the “pregnancy” part; your new-born baby starter is still just a baby and needs to mature and strengthen. Somewhere in the starter posts, I note how important it is – in my mind, at least – that one does NOT use their “mother” starter in their bread, hoping to remember to hold some back because it’s pretty much guaranteed that some day, you’ll forget and bake it and there goes your great 5 year-old starter. So when you go to make the starter for the bread and it says 1.5 cups (which, at 15g per tablespoon of starter* is then 360g) you feed your mom as usual. You then take the discard/excess and use THAT to build your starter for the bread. You also feed your mom as needed before she heads back to the fridge. Typically, from the fridge, you want to give the cold starter three feeds before using and returning to the fridge so it has time to perk back up to full strength from it’s cold snooze. Let’s say you want to bake Saturday afternoon. You go backwards from that and assume three feeds which takes you to Friday morning. Friday A.M., you take Mom out of the fridge and feed her 1:2:2, using warm water to take the chill off. Since you say you keep it at 28g (1 oz), you’ll add 56g (2 oz) each water and flour. Friday evening, you get back to 28g starter, removing the excess 112g, (goes to your pancake jar or the compost) and give it a second feed. Saturday morning and 3rd feed: you remove the excess 112g and feed the 28g as usual but ALSO feed 72g you keep from your 112g excess. Why 72 grams? 72g is 360 ÷ 5, the “one” part of 1:2:2. Feed this as usual and presto, you’ve built up to 360g, ready to use in your bread. You’ve also safely set Mom aside and, when she’s almost peaked, pop her back in the fridge until next baking day. I think my 2nd question was supposed to say “When SHOULD I start to prepare it for baking with it?, but I feel you answered that. Also, THANK YOU VERY MUCH for the detailed explanation about the “go backwards” 3 steps to the Friday morning to prepare for a Saturday afternoon baking. I had NOT completely picked up on that and would have used my mother starter. I’m now feeding on a 1:2:2 schedule twice a day but it’s not completely doubling every 4-5 hrs yet until i give it a little extra shot of flour (1-2 Tbsp usually does it). Plus lately here in New England the weather has been very inconsistent (sunny for 1-2 days into the 70s-80s, followed by 3-4 days of rain in the 50s-60s, then sun again back into the 70s-80s). So trying to get a warm environment has been hard. (but I keep plugging away). In the meantime, I’ve been keeping “my pet” on top of the fridge trying to get some of the warmth form the fridge not too much luck unless I nudge it along with a little extra flour (as mentioned above). So it looks like I have a little way to go. It better happen soon though though as I’m heading away on business for a few days and won’t be around to feed it (maybe the wife will take over the responsibility?!?). Can I give it one more feeding before I travel and just come back to it upon my arrival home? Thanks again as your guidance has been very helpful to me (and hopefully to others too). At this point, it would probably not kill your baby starter but might really set it back to go several days unfed. Once it has graduated to living on its own in the fridge, sure, go many days, even many weeks, between feeds. I’d suggest that you show the Mrs. how feeding is done then leave pre-measured little bags of flour and a glass marked with a line to the right amount of water. All she then needs to do is remove the set amount of old starter – perhaps another glass marked to the right quantity to take out and dump into the compost – and feed the remainder the water and flour. Morning and afternoon, again, is as accurate as it needs to be so she doesn’t need to worry about feeding exactly at 8 a.m. or 6:30 p.m. or whatever. You take out this much, which leaves you about two tablespoons, give or take, it doesn’t need to be precise. Add this much room temp water, stir, then add in one bag of flour. Stir again – it doesn’t need to perfectly mixed – cover and set aside on the counter until dinner/breakfast time. Repeat twice a day until I get back. Thanks Paul for all your advice! i wanted to take 2-3 days to wait until I replied to see where things were (and that’s a good thing). Seems that I’m now doubling “my pet” every 6-8 hours. I think that the wide flux in temps has really stifled growth, but it’s been pretty consistent here in New England these last few days. So i might try baking with it this weekend. What could really go wrong? No tang? A lesson learned? How is the starter doing a month or so later? Does it have a name yet? Sorry for the LATE reply. All your advice and guidance worked out well. The first time I used it, it was too mild. So mild that i barely tasted any tang. But i changed the feeding a little and I might have gone a little wrong as the culture became VERY sour (almost a pucker) when i baked with it a second time. Over all I was happy that I was able to get it to work. At this point it’s been in the fridge for the last 1-2 months, and I’ve neglected it. Will letting it come to room temp, and feeding it again bring it back? Again, all your help and guidance was EXCELLENT. Yes, it may take a few feedings – I’d certainly expect to feed three or four times – to get it back to speed but you can get your starter going again by doing just what you describe. Actually, if you just add warm water to the starter when you feed, you don’t actually need to let it sit to warm up. So fret not, your baby will be back to normal soon enough! Your info for Craig really helped me. I’ve started discarding half my goo since day 4 and now i’m pretty sure my population was too small then. 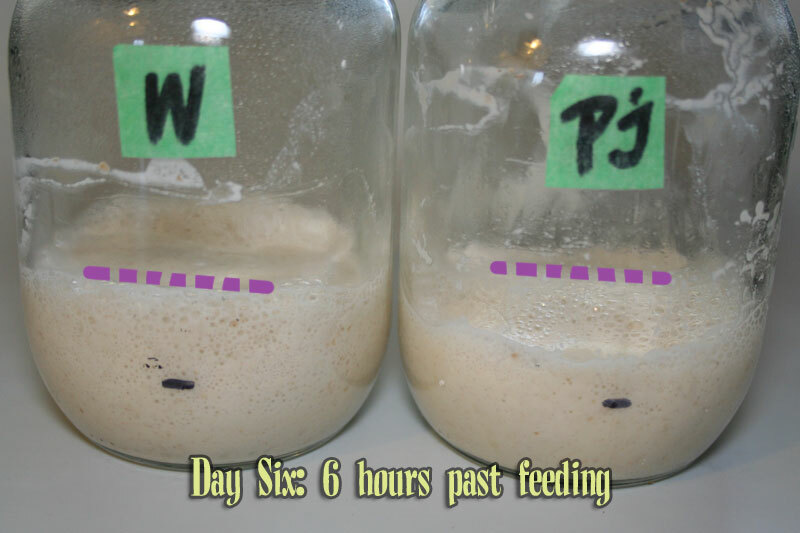 I’m on day 6 now and it seems bubbles and rise are getting less evident with every feed, sadly. I’m in Brazil, and days are getting cooler now so I’m keeping the jar under a lamp (30C appox). Clear fluid forms on top layer. Based on your advise to Craig I’ll stop discarding during feeds and maybe feed whole wheat for a while…? BTW, love your page, I hope you didn’t abandoned it as I see your last post was long ago. Still, great stuff! Thanks for the nice note and I hope that your new starter picks up shortly. Whole wheat will help that along, I’m sure. You say that liquid builds on top of the starter; when you;’re still in the first week, this is not likely due to the yeast using up all the food so the other likely reason is that your starter it too thin. Make sure the starter mixture is relatively thick, like heavy pancake batter. If you don’t have a scale yet, while you’re waiting to get it, you should be using about?? of the amount of flour in volume of water. So for every 1/2 cup of flour you add, you’d use? cup of water. If you make the batter too thin/watery, then this causes a couple of things: 1) the batter is too runny to trap the bubbles so even if you have activity in there, you won’t see much rise as the bubbles just float up and out. 2) the water collects on top because there’s so much of it, the flour just settles down at the bottom. 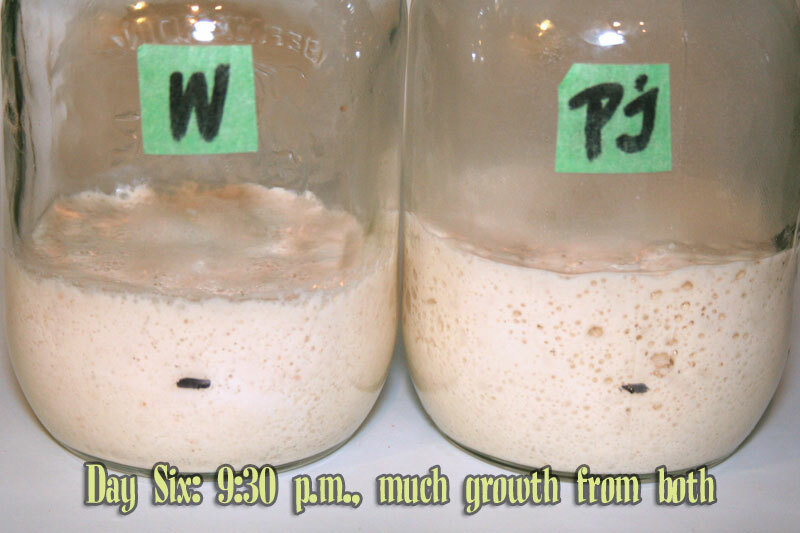 But EVEN SO, that doesn’t mean your yeast isn’t developing; it’s just doing so in a “too wet” environment and you can’t see the results that are still in there. So check that you’re mixing your starter to a fairly thick consistency of batter – much less than dough but a fair bit more than cake batter. And see if you can get yourself a decent digital scale to help you switch over to weights. Look at the post “Digital Scales: Which Weigh To Go?” for my recommendations on what to look for in a good kitchen scale. Best of luck with your new pet; and remember that probably THE most important ingredient in good bread making is “patience” so do give it time. You will get there! So it’s been almost 10 days after your advise which I followed and also experimented other actions (like using filtered water instead of tap, and adding a little sugar) and here are some curious facts: my guys don’t really like white flour, I’ve tried feeding it a couple times and the mixture doesn’t expand at all. I’m now regularly using rye flour (1:1:1 2x a day) and then yes, it grows very nicely and consistently. So I’m wondering why white flour is not working and how it is going to be if in a few days I want to bake white bread…? I thought maybe is because I’m using bleached flour? …(unbleached is not available here). I will presume that by now you may have gone ahead and tried to make some bread. How did it go? I cannot think of any reason that white flour, even bleached, would cause your yeast to not expand at all. There should be some growth. Yes, bleached is less desirable than unbleached, which is less amazing at feeding the yeastie critters than rye. But this doesn’t mean that bleached flour will do “nothing”; it’s just lower down the scale of yeast’s fave foods. You may want to increase your feed ratio from 1:1:1 to 1:2:2 and make that “2” flour 1/2 white and 1/2 rye, see how that does. And don’t add sugar. I am trying to make starter, and your conversation with Craig was helpful. I’m writing to you to see if this gets your attention, because you really seem to know what you’re doing. I am going to retire on a sailboat in a couple of years and I would like to take a sourdough starter with me so that I don’t have to worry about taking yeast with me. I have also heard that sourdough bread is better for you than wheat or white bread. And, I just really like sourdough bread better than any other bread. I started my “starter” (now named George) 6 days ago. I followed someone’s directions, which I found before I discovered your website. He said to put 40 grams of a blend of rye/all purpose white into a jar and stir in 40 grams of water. The next day, I was supposed to remove all but 40 grams and add in another 40 grams of flour and water, each. I did. Every day, according to his instructions, I have been removing all but 40 grams and then adding a combo of 40 grams flour and 40 grams water. I have never seen it double. I’ve seen it bubble a touch, but nothing to get excited about. Based on what you wrote to Craig, I think I need to cut back on water or increase the feedings. I’m not sure. This is still a bit confusing to me. So far, I’ve been feeding George every day, in the morning. What do you recommend at this point? I appreciate your feedback. And thank you. I decided to feed George this morning at the usual time, but this time I didn’t remove any starter. I simply pulled George out of his container, cleaned the container, put George back, and then figured out George’s weight. I added equal parts flour and water. I did notice that George had a thick skin. I only removed part of the skin and mixed the rest of it in with the water/flour, put him back, and then drew a line. I put him back on the high shelf in the closet that is the warmest place in the office, and about 4 hours later, he is almost double in size. I will keep reading your blog about making sourdough bread to figure out the next steps. Thanks for sending in the comments and sorry I didn’t get back to you sooner. Life in the bakery has been hectic these last few days with Canadian Thanksgiving this weekend, and my attention has been focussed there. First, as to the recipe you followed, directing you to use 40 g water and 40 grams flour (blended rye and AP) – that is a perfectly good mix to get your starter going. I would recommend, as you’ll have read in the Starter Saga here, that for the first few feeds you do NOT remove any starter but simply build up the existing amount. Why? Because your culture is very limited at that point and you need to carry over as much of it as possible for those first few days. After a bit, you can then cut the original back to that 40g of old starter and feed 40g water and 40g flour. But start with just building a somewhat bulky baby starter where what you feed is increasingly less and less, proportional to the “old” stuff. It should be pointed out that this phase is not even close to getting populated by the actual yeast and bacteria you desire; it’s merely getting the pH levels down in your starter batter so the environment is slowly getting closer to ideal for your little critters to start activating. Those first few days are quite different for lots of people, since what critters ARE setting up shop (and then just as quickly getting booted out by the next short term tenants) may or may not be gas-producing dudes; it’s total luck of the draw who sets up shop in your flour soup. So the presence of bubbles or lack thereof isn’t a sign things are going well or badly. Basically, no matter what you see or don’t see, what’s happening regardless of what strain of critters are in there, they’re all doing the same thing: changing the pH levels. OR what you’ve just witnessed IS the real critters finally setting up shop. Only way to tell for sure is feed as usual and see if it expands again and again. Once you’ve seen that happen and can tell it’s repeatable, THEN hand out those cubans to all your family and friends. You’re now a proud sourdough critter momma to a few million (eventually) new pets, all of them named George (sort of like the George Foreman family). Your newly founded starter will actually be a real ‘thing’ and not just a work in progress. “Thick skin”: that would likely be from the container not being well sealed enough. Put the lid on, even loosely, so extra gas can escape but air isn’t going to get in and dry up your starter. So keep feeding George as you’re doing and see if he isn’t coming back for more regularly. If not, DO NOT DESPAIR, you haven’t killed your baby off. This is the primary reason for using pineapple juice in your first few feeds of your flour soup experiment; it helps lower that pH right away and avoid the soul crushing experience (and often the tossing out) of an otherwise invisibly active but seemingly dead starter. Let us all know how George does in the next couple of day. Thank you, Paul. It has been really exciting. By the way, I was concerned that you might have become so busy with your bakery that you might not even come back, so I’ve been reading and re-reading your blogs. I also read Debra’s Post 1 and Post 2 several times. I feel like I’ve been in school for the past 2 weeks. Very, very helpful. She should win an award for her discovery. After I decided not to remove any starter and simply fed George a 1:1:1 mixture, it did rise, as I said, but it turns out it wasn’t a false rise. Since then, it has been rising (but not falling), so I increased the feedings to morning and evening and increased the mixture to 1:2:2, as you indicated. The first load didn’t rise too much. It tasted like sourdough bread and was spongy, but it was a bit flat and heavy. The second loaf, because I only had room in my oven for one loaf at a time, sat out for several hours longer before it was baked. While it didn’t rise as much as it should have, it did rise to twice the height of the first loaf. We sliced it and fried it in butter and enjoyed it immensely. If it tastes that good when it’s not ready yet, I can imagine how good it will taste when we try again. That batch was made with WW, so I’m trying again today, but this time with a simpler recipe and with white bread flour instead of WW. The recipe I’m using comes courtesy of “theclevercarrot” and it’s supposed to be a beginner’s bread recipe. What I love about your website is how well detailed your explanations are so that those of us new to bread-baking can figure this out. I tried this long ago and threw out the soupy mess after a few days or a week because it just wasn’t right, lol. But back then, I didn’t find your helpful explanations. I don’t know if I told you my reason for wanting to learn to make sourdough bread. Other than the fact that it’s my favorite bread, and the fact that it’s healthier for you than other types, it’s made without commercial yeast. We’re going to be leaving on a sailboat in about 2 years. I’ve been learning how to can meats and fruits and dehydrate vegetables, but I’ve been in a dilemma about bread. Although we don’t eat a lot of bread, I want to make a healthy loaf and not worry about running out of yeast. Thank you again. I’m glad you’re still here, even if not terribly active. Even though you didn’t come back right away to answer my question, feel confident that if someone has a question, all they have to do is read all your instructions and then all the comments at the end of each post for days 1 through 7. You might even tell people at the end of Day 1 that if they have questions, read the comments under each post. That has been very helpful to me. So, no need to answer my question. Once the yeast is activated and strong, I can feed it anything I want. I will probably always feed it plain old white flour, and only change the flour when I’ve removed some starter from George to make a loaf of bread. I liked what you said about always keeping the sanctity (so to speak) of your starter. I’ll take out about a quarter of a cup, measured in grams, of course, feed George a small amount to replace that, then I’ll use the amount I took out to make bread, feeding it over several days with whichever flour will make the kind of bread I want to make. I guess I’m off and running. You made it easier to understand, and if it wasn’t for you, I don’t know if I would have been successful, but this was difficult. You can’t just “make sourdough bread.” It’s an art form. I have run into many recipes for sourdough bread that call for sourdough starter, but their sourdough starter is made instantly using commercial yeast. Anyone can do that. It’s not the same thing. And I don’t want to use commercial yeast. Understanding the basics of how the different bacteria in flour are released in the flour/water mix, ultimately bringing the pH down over time, to create an environment in which the yeast wants to wake up, is ultimately going to help me truly understand “making sourdough bread” from the perspective of an artisan. Sorry about the delay in responding; I’ve read both your recent comments and seeing that you were doing quite well, put off replying “for a day or so” which turned into way too long. So apologies for that. You seem to have already got a good grasp of the process so I don’t actually need to make any real suggestions to you. But since part of the point of this blog and the comments on it is to help out other people with the same sort of questions, I’ll add a little bit of info as well. I’ll direct this to the two posts combined. Yes, it’s completely acceptable to switch off the rye once your starter is good and active. You may still want to feed it a portion of a feed in rye (say 1/2) every now and then when you are finding the starter getting a bit sluggish. Rye seems to be an excellent flour for “boosting” your starter back up. And half one feed of rye will easily be reduced over the next few feeds to practically nothing so you can still call your sourdough “white”. FYI, my standard, “go to” sourdough recipe is based off Jeffrey Hamelman’s Vermont Sourdough and contains 10% rye flour anyway (one could use whole wheat instead) so feeding the starter rye at any point doesn’t affect the loaf any. You’ve found the info on switching your starter from your “basic” (AP for you) to any other style so I don’t need to explain that. I will add that using this procedure does save you from using up extra fridge space (particularly important in your limited space situation on a boat) and makes keeping and feeding one single strater the most logical use of your supplies and time. And don’t sell yourself short: you’re already an Artisan. 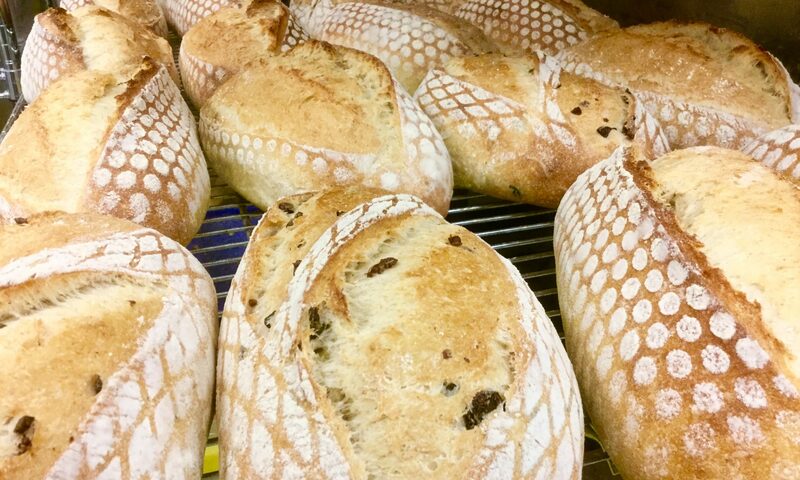 If you are creating loaves by hand – or as much so as possible – and with established procedures that respect the integrity of the product, that qualifies you as an “Artisan baker”. Best of luck on your sailing ventures and I hope you can post pics of your “Artisan Bread Baking at Sea” adventures now and again.